Baldness is never a welcome condition. Men don’t like it and for women it is even more difficult as it is not accepted to walk around bald headed. So, when a woman loses her hair during chemotherapy, chemo hats, scarves and turbans, as well as wigs come to the rescue. Depending on where you live and your seasonal weather conditions, the choice of what to wear will depend on not only covering the bald, but keeping warm or protecting your head from the sun. Hats are everywhere in stores, but finding one for covering your head when you have no hair is a little different. A bald scalp is more sensitive. Scratchy or hard fabrics will irritate your skin. Soft is better. Finding a hat that covers the hairline can be a challenge. Chemo hats are designed with this in mind so you are not advertising bald. Variety is fun. Mix up hats and scarves and turbans. Add lots of colors, prints, etc. Find a comfortable cap for at home and/or sleeping. It can get cool at night when you have no hair. Cotton knit is best. As your hair grows back, these hats can stay in your wardrobe. They still work and add an extra fashion statement to any outfit. Odd statement, I’m sure, but it can be real. Having been bald myself due to chemotherapy, I can attest to the fact that there were times I got favourable comments on my appearance when I wore attractive scarves and chemo hats. There are many options to find the good in a situation that is less than ideal. If you are so inclined, you can knit yourself a hat or fashion a scarf into a vision of style and chic. However, not all of us are so gifted. In this instance, ready made chemo hats and scarves are invaluable. They offer style along with comfort and protection. I found the hats that covered my ears and hairline best. However, I went through chemo in a northern winter climate. Scarves were excellent as long as they weren’t tied too tight and thus cause ear discomfort. With the many options in the marketplace, you should be able to find something to suit your personality and immediate need. Scarves as chemo hats are wonderful. Most women have a variety of both options. Hats you can pull on quickly, come in warm and cozy fabrics for winter temperatures, but also in cool cotton for summer. With scarves, you add a dimension of chic. They come in different fabrics, patterns, colors, sizes, and can be wound into many different styles depending on your sense of fashion. In fact, a lot of women get complements on the extra pizazz their scarf added to an outfit. Team it up with great makeup and earrings and you feel like a million bucks when in fact you probably don’t. Sure does give you a boost though. Try different styles – check out different ways to tie them. I always looked for styles that didn’t cramp my ears when I’d had a scarf or hat on too long. Everyone is differrent. Find something that suits you. After all, you will be wearing them for a while. Going bald from cancer treatment sometimes creates anxiety – for women in particular. Baldness is not common in women nor socially acknowledged. Men are not happy with bald either, but at least it is more accepted. How to cope? First, accept the fact that baldness will occur. Instead of letting hair fall out in a messy fashion, bite the bullet and get your head shaved. However, before your treatment starts, find a wig that matches your hair color, have it styled and ready to wear. There are many lovely and comfortable wigs available these days. It is my experience, though, that most women wear chemo hats and scarves as the more practical choice. Shop around, find what suits your style, and make sure that the hat covers your hairline. I also found that something loose around the ears prevented the long wear pinching and discomfort. Chemotherapy quite frequently results in hair loss. For women, this is can be difficult on self-image. Finding new and interesting ways to look and feel good during this time requires a different mindset. I recall my own experience with hair loss. As soon as my hair started falling out, I shaved the rest off. Less messy – a moment of being in control – taking charge of what was to be. Since I knew this was going to happen, I had checked out chemo hats, scarves, wigs, etc. beforehand. I was prepared. Find fabrics and yarns that are soft. Knit fabric and yarn on bare skin can be scratchy and itchy, especially wool. Polar fleece blocks the breeze, is much warmer for winter climates, and cozy. 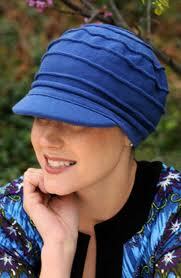 Styles that cover ears and hairline are less obvious a ‘chemo hat’ to the general public. When weather was warmer, I opted for brimmed summer hats. Most of the time, I found intriguing ways to tie scarves so they became a fashion statement rather than an advertisement that I was a cancer patient. Teamed with unique earrings and make up, I felt I looked great, even if I didn’t feel that wonderful. A wig was worn for special occasions because at the time of my treatment they weren’t as nice unless you paid a fortune. Nowadays they have wonderful styles and lighter weight wigs that are inexpensive and look real. The cap on the inside is also much softer and less scratchy. However, most women I talk to can’t wait to get their wigs off and put on a soft cozy hat or scarf. It’s an individual thing! There are lots of options out there. It’s an area where you can have fun, be playful, and wear what suits your fancy. You are the most important person. Your choice!! Where I live, we are in extreme cold and having no hair while going through chemo means finding ways to keep the head warm. But you may live in a warmer climate where style is the issue more than warmth. There are lots of ways to still be chic and fashionable. I found tying scarves in creative ways actually brought me flattering comments and scarves were, in fact, more comfortable than a wig and less expensive. Chemo hats are another option when you can find ones that come below the ears and back hairline. Comfortable fabric is key since the head is bald and anything rough can be scratchy. There are lots of styles and fabrics to choose from depending on your circumstance. Occasionally, going bald can be an option. It is a statement that says ‘I’m okay with who I am and where I’m at in this moment’. I went hat, wig and scarfless, especially in the humid summer. Didn’t seem to bother anyone, and if it did, that was their issue. So, check out your options. Have fun with it. You might as well. Take the time to wear outfits and looks that you might not have tried before. I also found wearing makeup and earrings also helped the whole look and made me feel totally together in a new way. Why Does Chemo Make Your Hair Fall Out? Chemotherapy is widely used to kill cancer cells and prevent the disease from spreading, but the drugs also impart some damaging side effects. Since the drugs are unable to differentiate between cancer cells and normal cells, many ordinary, otherwise healthy cells are destroyed during the therapy. This is why fatigue, nausea and low blood cell counts are all common for chemo patients. But one of the most noticeable changes brought about by chemotherapy is hair loss. The drugs attack the root cells of the hair, triggering alopecia in as little as 2 to 3 weeks into treatment. There are several ways to cope with this hair loss, including wigs and specially designed chemo hats. Over the years, several programs have been developed to help supply chemo patients with real hair too, including Locks of Love. A good basic knit hat is always a mainstay of any wardrobe. It goes with anything, can be dressed up or just worn plain. It also covers the whole head keeping you warm and snuggly on the coolest of days. Plus it travels well, can be rolled up and stuck in a pocket, and doesn’t scream – ‘I am bald’ – as is often the case when you are going through chemotherapy. The only difference may be wearing a hat on days when others don’t find a hat necessary. Add a colorful scarf as an accent, wear it under a wide-brimmed hat, put a pin on it or a felt flower, wear really big colorful earrings – the ways are limitless to add pizazz and Wow Factor to an otherwise sensitive time in your life. Women are not accustomed to being bald. Even men have trouble with the issue of baldness, but at least it is more socially accepted. So have a look at various styles – hats, scarves, turbans, wigs. It’s time to be creative and time to be comfortable. Do what makes you feel good. Cooler days are coming and being bald from cancer treatment, namely chemotherapy, means finding something to keep your head warm, not just covered up. These days, there are many stylish options that don’t scream ‘cancer patient’. 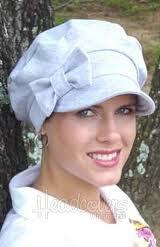 Chemo hats that cover your ears and come down low in the back of the head below the hairline are the best choice. Alternate between hats, scarves, turbans – have some fun with different fashions, colors, fabrics depending on the climate in which you live. I always found there was an occasion for each – casual days at home, outings with friends, appointment days, and dressy times when you want to look fabulous. Not everyone has a wig or can afford a real hair wig. Hats, scarves, etc. can be classy and are affordable. One wouldn’t think anything about what to wear on your head when you go to bed unless you have lost your hair due to chemotherapy. Hair keeps the heat in and when you have no hair, you get cold. Remember the pictures of people in the olden days wearing their sleep caps. Those were the days when there was no central heating and winter nights were cold. Fashions have changed a lot since then. Chemo hats are a great option. They keep you warm at night, especially a cozy, comfortable knit that is soft on your head and stays in place. Choose a color that makes you feel relaxed and beautiful. A cotton fabric is also best to help wick away the night sweats.